In anticipation of next month’s 25th anniversary of the iconic sci-fi series THE X-FILES, 20th Century Fox Consumer Products has partnered with Mattel to develop THE X-FILES, Barbie® collection showcasing fan-favorite television characters, Special Agents Fox Mulder (David Duchovny) and Dana Scully (Gillian Anderson). Available starting today on Amazon.com and on the Barbie.com, THE X-FILES Barbie® dolls celebrate the influential series that went from breakout sci-fi favorite to massive global hit, becoming one of the most successful television dramas of all time. Inspired by the hit sci-fi series, this doll assortment includes: Barbie® The X-Files™ Agent Fox Mulder doll, and Barbie® The X-Files™ Agent Dana Scully doll. Each doll wears their signature looks from the ‘90s – dark suits, “FBI” ID and badge. 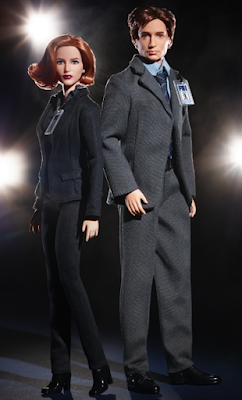 Fans can relive Mulder and Scully’s investigations of unexplained, mind-bending cases with each of the series-influenced Barbie dolls, both arriving with a doll stand and Certificate of Authenticity. On the series’ 25th anniversary on September 10th, “The Truth is Out There Trivia Contest” will officially land on Shop.Fox.com. Participants who answer the most questions correctly, before the contest closes on September 17th, will automatically be entered to receive “The X-Files” 25th Anniversary Prize Pack – which includes the Barbie® The X-Files™ Agent Fox Mulder and Barbie® The X-Files™ Agent Dana Scully dolls. IDW Publishing – Ongoing X-Files publishing partner, IDW Publishing releases a 25th anniversary comic, The X-Files: Case Files. Under this banner, faithful fans will see the release of numerous micro-series, featuring stories that explore X-Files of the past and present by top talent from comics and prose! Loot Crate - To celebrate the 25th anniversary of X-Files, Loot Crate, the leading subscription commerce platform for fans, will feature X-Files related items in its September “Invaders” themed Loot Crate, Loot Crate DX, and Loot Wear product lines - including an exclusive “X-Files Dimensional Poster” collectible in Loot Crate DX that commemorates Mulder’s iconic “The Truth is Out There” poster! Rizolli – The latest collaboration with Rizolli lets fans revisit Fox Mulder and Dana Scully’s unexplained, mind-bending cases with “The X-Files” 2019 Wall Calendar. Featuring images from their investigations, the calendar showcases the series’ classic storylines, including alien abductions, the threat of the Fiji Mermaid, the New Jersey Devil and more. Additional must-have items include: The X-Files Origins (Volumes 1 and 2) from Macmillan Publishers, Quirk Books’ The X-Files: Earth Children Are Weird, The Coop’s X-Files Case Journal and Evidence Bag Lunch Tote, Hallmark’s Mulder and Scully-inspired plush toys from their itty bittys® line, action figures from Diamond Supply, and coming soon from Rittenhouse Archives, The X-Files Trading Cards. The X-Files originally premiered on September 10, 1993. The influential series went from breakout sci-fi favorite to massive global hit, and became one of the most successful television dramas of all time. The show, which earned 16 Emmy Awards, five Golden Globes and a Peabody Award, follows FBI special agents Scully (Anderson) and Mulder (Duchovny) as they investigate unexplained cases – “X-Files” – for which the only answers involve paranormal phenomena. Produced by 20th Century Fox Television and Ten Thirteen Productions, The X-Files is created and executive-produced by Chris Carter.